Legislators are realizing that working toward changing workplace cultures to be more inclusive, fair and equitable takes more than a one-hour supervisor training session scheduled every two years. The District of Columbia is the latest in a growing list of jurisdictions that are requiring employers to train not just supervisors when crafting sexual harassment prevention programs, but employees as well. New York recently required employee training; Delaware is next on January 1, 2019; and New York City will follow in April 2019. But an emphasis on employee training has not always been embraced by legislators, or employers, as a way to deliver cultural change. At one time, the prevailing wisdom involved employers providing training to employees on a need-to-know basis. The focus of sexual harassment training was less on prevention and more on minimizing liability. “Why let employees in on the elements of a sexual harassment claim? You’re teaching them how to file suit,” many leaders argued. But the prevailing wisdom is changing. Many employers now view sexual harassment prevention training as an opportunity to remind supervisors that unlawful practices will not be tolerated. Training programs announce to employees that they are valued and will be protected in the event of an incident. To many, creating a tolerant culture is seen as good for a company’s reputation and, therefore, good for business. 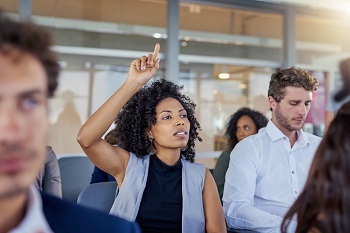 Like many employers, the EEOC has also changed its focus regarding compliance training from one of mere supervisor training to one that transforms workplace cultures. The emphasis on co-workers and non-managerial employees is highlighted through bystander (“upstander”) concepts and an overall emphasis on respect in the workplace. Creating awareness– enabling bystanders to recognize potentially problematic behaviors. Creating a sense of collective responsibility– motivating bystanders to step in and take action when they observe problematic behaviors. Creating a sense of empowerment –conducting skills-building exercises to provide bystanders with the skills and confidence to intervene as appropriate. Providing resources– providing bystanders with resources they can call upon and that support their intervention. Resources to call upon that support their intervention. In addition to changing the components of mandated training, the universe of those who must be provided with training is growing ever larger. Legislation targets smaller employers (examples include California and New York). California has acknowledged the complexity of professional relationships that fall outside the traditional employment context by emphasizing that sexual harassment is not to be tolerated in any context, including those that involve power dynamics outside of employment: producers and investors will soon have a more difficult time defending against sexual harassment claims. The power dynamics of the board room are affected by new laws as well: a new XpertHR podcast, California Dreaming – New Employment Laws Send Shock Waves, details the forthcoming requirements for greater female representation on boards of directors as well as broader sexual harassment protections. Individuals outside of contractors or employers have also been targeted for legally mandated training based on the practicalities of a particular relationship. For example, parents of child performers must now certify that they have received training in sexual harassment before a minor may receive a work permit. Under the Property Services Workers Protection Act, California janitorial employers must provide biennial in-person sexual violence and harassment training for employees and employers starting January 1, 2019. During the 2018 legislative session, California expanded current sexual harassment prevention training requirements beginning January 1, 2020. Health and nutrition, for talent agencies. What types of training would bring about the most positive change in your workplace culture? Please share your experiences with us.